The African-American community, in short, has been fertile with ideas concerning racial uplift across the late nineteenth and early twentieth centuries. This diversity of ideas has been as evident in the Black Catholic community as in the African-American community in general. To begin with, African-American Catholics possessed two distinct and occasionally competing identities: African-American and Catholic. African-American Catholics also shared a number of qualities with other Catholic minority populations. Beginning in the 1840s, large numbers of European Catholic immigrants began arriving in the United States. Coming from different nations and cultures, these groups expressed their faith in a great diversity of ways. For nineteenth-century German Catholic immigrants, efforts to preserve their language often drove a wedge between them and English-speaking American Catholics. By the early twentieth century, migration of Catholics from eastern and southern Europe changed the face of the Catholic Church once again, as Polish and Italian Catholics, among others, brought their own languages and traditions into the American Church. For members of the African-American Catholic community, such questions of identity and loyalty were as vital as those posed by the different groups of European Catholic immigrants. 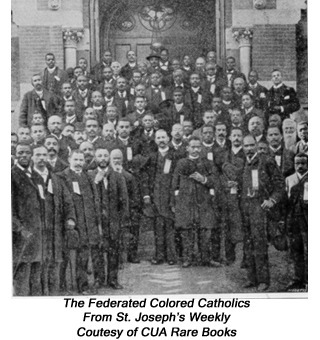 These issues took center stage in the establishment and struggle for control of the Federated Colored Catholics (FCC). Bracketed by the First World War and the Great Depression, the rise and fall of the FCC illuminates many issues that have surfaced again and again in the history of the American Catholic Church.